Today, the complete list of Modern Masters 2017 goes up, and I’m busy refreshing pages and going crazy just like you. I’m keenly aware of some truly amazing cards and the higher distribution, and I can’t wait to find out how overpriced my shop is going to hold drafts at, but I want to focus on the fetches in MM17 and what the future holds for them. We have a baseline for what’s going to happen to the enemy fetches from Zendikar, with their inclusion in MM17: The allied fetches in Khans of Tarkir. Let’s look at Polluted Delta. This was at more than $100, just from Legacy and casual demand. Going from Onslaught to Khans is an enormous jump in availability, but there was a new demand as Modern players could now add these to decks. A loss of half was immediate, and it’s halved again. Notably, the demand hasn’t spiked since the KTK printing, though this is the Onslaught version we are looking at, the original. It’s lost a lot of value and hasn’t recovered, which is a bit of a surprise to me. Let’s look at what the Khans version has done. First of all, it’s at half the price of the Onslaught version. 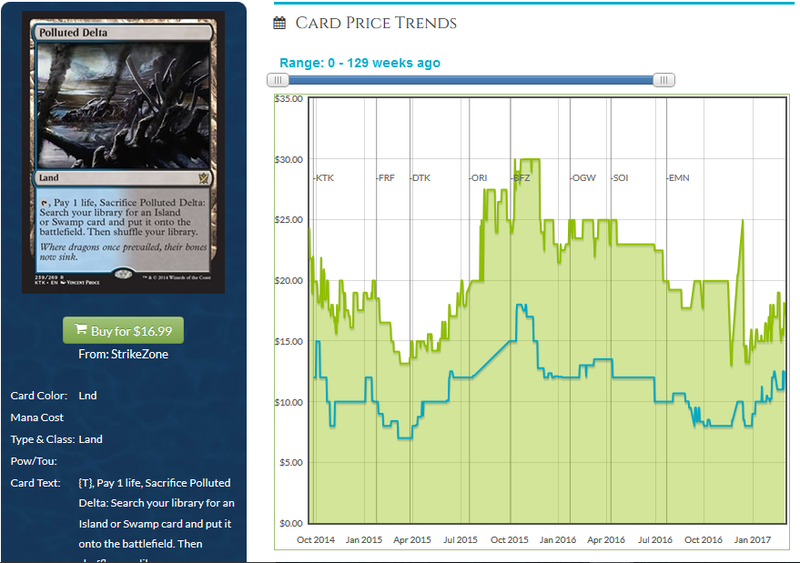 It’s much more common, yes, but this is a big gap for a card between its two printings. I think that with such a big difference in art and frame, I’m not surprised that there is a gap, which is consistent across all five of the fetches. People are willing to pay more for the old version. I am surprised that the gap has held. We’ve got six versions of allied fetches for you to choose from, allowing you to balance your budget with your desire for the shiny or unique. What this means for the enemy fetches is this: I’m expecting them to lose value immediately, down to the $15-$20 range. 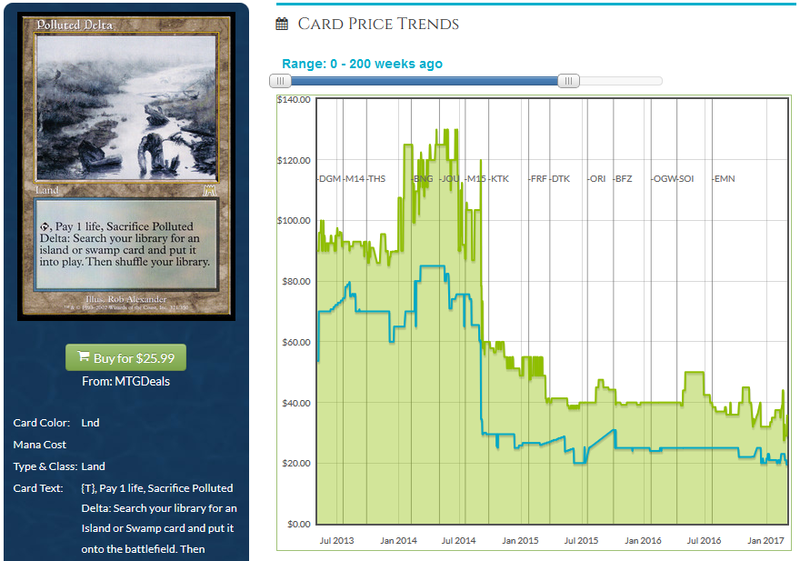 I expect them to recover somewhat at the start of Amonkhet, and start an upward creep…but not very far. Reusing the art is a big deal for the fetchlands. These are going to be the same as the originals, except for the expansion symbol and other small frame tweaks, and that means the originals are going to be dragged down in price significantly. If I had them, I might try to move extras but buylists might not be honored now, and I can’t imagine eBay sales are going to happen much. It couldn’t hurt trying to sell them now, but I don’t think you’ll get very far. If you’re holding nonfoils, I think you’re going to simply have to hold onto them and accept that you’re going to have to wait some time to get much of your value back. Foils, though, that’s a different matter. I doubt that the foils are going to recover effectively, given that there’s a super-chase-mega-rare one to go get, but my guess is that the foils take a hit of about 40% and then stabilize. Having the new foils look almost the same as the old ones is going to mean that the older ones come down toward the newer ones. Modern Masters 2017 has a truly ridiculous number of chase cards, and I want to address what Wizards is trying to do: make the format cheaper and sell a bunch of packs. I don’t think this is a move of the desperate, but they are trying to goose player interest in the format. Modern as a format has looked flat, but my goodness, we have a lot of toys to play with in this set, some of which harken back to other amazing formats, e.g. Mystical Teachings. While I think that the fetches are going to stay stable, I suspect that this is going to lead to growth if the player base grows. Fetches are going to be the canary in the coal mine for Modern: If the players come to the format, the prices of the lands will be the first to show it. This set is gas and it’s going to get a lot of people playing the format because the cards will be cheap. Make no mistake, this is going to torpedo some prices significantly. Stores have more product. Some stores are selling boxes for less than the MSRP of $240, and that’s a sign for how much product they want to move. There’s going to be a lot of Liliana of the Veil running around, a lot more Damnation and Blood Moon, and people want to play with their awesome new and expensive cards. I think that Wizards is sending another signal here: Anything not on the Reserved List is fair game. The EV on a MM17 pack is ridiculously high, at least for right now. That won’t last, though, as packs get opened and prices crash. Remember that stores get boxes from distributors for less than retail, and they will open boxes if the price is right on singles. That pressure will keep the price of the non-chase cards super duper low. In previous sets, they decided to cap the values of boxes, by only reprinting so many valuable cards. This is not the case in 2017, instead they chose both low-print-run cards (Liliana) to cards they have goosed a bunch (Tarmogoyf) and so on. Going forward, nothing’s safe. Please keep that in mind as we go forward into this brave new world.